But I learned something this week. You can’t really reason or rationalize with a child. It can be difficult to imagine or consider that there is another person, more specifically a child, inside yourself, but when I think about it, I am a rational adult on the outside, in life, but my feelings and old wounds, or thoughts that are based in old situations are less controlled/measured, like those of a child. There’s a story behind this revelation, but the more I work through stuff, the more I am leaning that it’s not about the individual instances, it’s about where the feelings are coming from in those situations. The bottom line is, I was/have been dismissing my feelings, because they could not always or immediately be rationally explained and the chaos/inner turmoil is very hard for me to live with. This goes back to my need to fill the emptiness. Fill the silence. I have a hard time feeling the feelings and then patiently inquiring what they are about and where they are coming from. I am much more comfortable putting together a firm story that explains everything away, or just go for the food and avoidance of feeling them in the first place–probably not even in that order. The rationalizing away the feelings is new (at least consciously) since shining a spotlight on the old crutch, food. Interestingly enough, when I started questioning the urge to rationalize all the feelings, I discovered that this has been part of my mechanism against my mother. When I repeat some of the things she has said to me over the years in therapy or group, the reaction I usually get is that her statements aren’t reasonable/realistic/based in reality/rational, etc., which has always bothered me. A lot! I consider it a huge weakness, so I go completely in the opposite direction. In order to not get sucked into her illogical beliefs and become irrational right along with her, I used reasonable, sensible, logical arguments (well, logical to ME) to avoid the emotional response I didn’t want to feel, or didn’t want her to see. But here’s the funny part. I always tell one of my friends that “you can’t reason with crazy.” That’s not a mental health comment. I mean you can’t reason with someone who refuses to be reasonable. 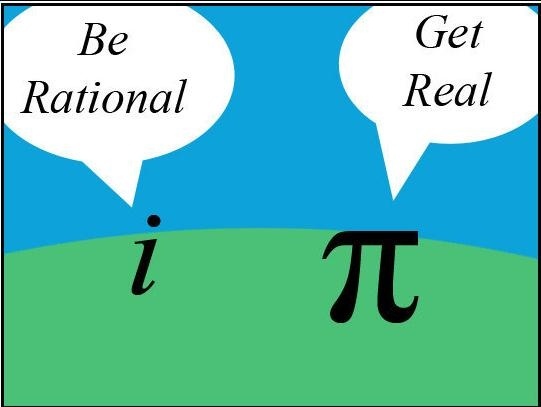 Just like the numbers in the math joke below can’t make each other real or rational. So at the end of the day, I need to accept that feelings don’t HAVE TO be rational/reasonable/well thought out. It’s OK for me to feel them and be frustrated, without having to soothe myself with food or reason. Acknowledging my thoughts and feelings and accepting that they are OK and somewhere deep down have a source that will make sense some day might even might keep my inner child from digging in her stubborn heels to get a reaction out of adult me. I’m going to keep an eye on that and let you know how it turns out. I have more to say about intellect versus senses, but let’s save that for another day.